HONG KONG (AP) - Police arrested seven crew members from two boats that collided in Hong Kong waters, killing 38 holiday revelers, but offered no explanation about how the vessels ran into each other on a clear night in one of the safest and most regulated waterways in Asia. The Monday night crash was Hong Kong's deadliest accident in more than 15 years and its worst maritime accident in more than 40. Some relatives of the dead went to the scene off Hong Kong island's southwestern coast to toss spirit money in honor of the victims on Tuesday, while others waited at the morgue for news about loved ones. Police Commissioner Tsang Wai-hung said six people were detained on suspicion of endangering passengers by operating their craft in an unsafe way. Police later announced a seventh arrest. Tsang said both crews are suspected of having not "exercised the care required of them by law," but he did not elaborate. A ferry collided with the Lamma IV, which is owned by the Hong Kong Electric Co. and was taking more than 100 employees and their families to famed Victoria Harbor to watch a fireworks display in celebration of China's National Day and mid-autumn festival. The government said 101 people were sent to hospitals, 66 were discharged, and four had serious injuries or were in critical condition. The ferry was damaged but completed its journey, and some of its passengers were treated for injuries. Local TV later showed its bow chewed up and chunks missing. Hong Kong and Kowloon (Ferry) Holdings Ltd., the ferry operator, did not return calls seeking comment. The government said 28 bodies were recovered overnight, and eight more people were declared dead at hospitals. Two bodies found aboard the vessel Tuesday raised the death toll to 38, according to government statements. At least four of those killed were children. 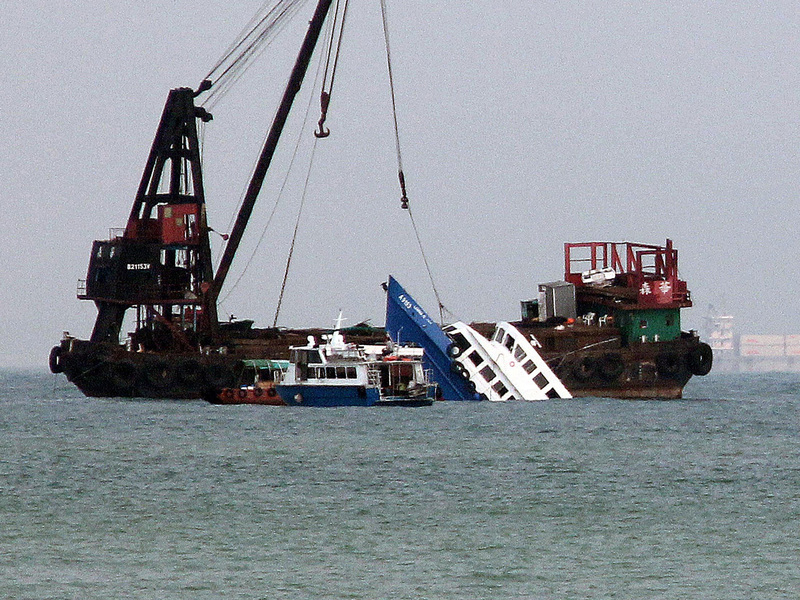 Salvage crews raised the half-submerged Lamma IV using three crane barges. At the same time, several dozen relatives of victims traveled by boat to take part in a traditional Chinese mourning ritual, praying alongside Taoist priests and tossing spirit money into the wind. Survivors told local television stations that the power company boat started sinking rapidly after the 8:23 p.m. collision. One woman said she swallowed a lot of water as she swam back to shore. A man said he had been on board with his children and didn't know where they were. Neither gave their names. Though there was no immediate word about how the collision occurred on Hong Kong's tightly regulated waterways, it appeared human error was involved. Both vessels should have been illuminated by running lights when they crashed near Lamma island off the southwestern coast of Hong Kong island. Such large-scale accidents are rare for Hong Kong, a semiautonomous enclave off mainland China that has one of Asia's most advanced infrastructures and economies with first-rate public services. The accident is the deadliest to strike the territory since a 1996 high-rise fire that killed 41, and the deadliest ferry accident since 88 people died during a typhoon in 1971. Yuen Sui-see, the director of operations of Power Assets Holdings, the company that owns Hong Kong Electric, said the Lamma IV was carrying 121 passengers and three crew members, well below its capacity of more than 200. "There was a boat that came in close and crashed," he said. "After the crash, the other boat continued away. It didn't stop." The ferry involved, the Sea Smooth, has a top speed of almost 45 kph (28 mph) and carries up to 200 passengers. Several dozen relatives gathered at Hong Kong's morgue to await information on their loved ones. A man who gave only his surname, Lee, said he and several relatives had spent the night searching for his 52-year-old sister, who had boarded the utility company boat with three co-workers. "My niece called me last evening and said she believed my sister was on the boat so we should do something right away, we should go find them," he said. They went from hospital to hospital, to the pier and a nearby yacht club. On Tuesday Lee was at the morgue, which he said would be the best place to get information. Victor Li, deputy head of the company that owns Power Assets, said the company would provide emergency payments of 200,000 Hong Kong dollars ($25,800) to the family of each person killed. Li's father, Li Ka-shing, is Asia's richest man. Power Assets and Hong Kong Electric, one of the city's two electrical utilities, are two of several companies in the elder Li's sprawling business empire. Li Ka-shing visited a hospital Tuesday and told reporters he felt "very sorry." "I don't want to say too much. I just know that many people have passed away," he said in comments broadcast on Cable TV Hong Kong. Social media sites lit up with discussion of the tragedy and condolences for the victims and their families. The tragedy is a test for Hong Kong Chief Executive Leung Chun-ying's new Beijing-installed administration. His July inauguration was greeted by protests, and opposition by students and their parents against the proposed teaching of China-influenced patriotic history forced his government to back off the plan last month. After the collision, Leung rushed to the pier where rescue work was taking place. He said he would set up a commission to investigate the crash.